Rock Climbing and Bouldering Pennsylvania, Secrets of the Keystone State. Is a 500 page guidebook published in 2011. For 2018 we are redoing this guide and it will be completely redone, adding new areas. The book will be split into 3 separate guidebooks: An Eastern Pennsylvania climbing guide, a Central PA guidebook, and a Boudlering guidebook for Pennsylvania. We have also partnered with Next Ascent to have guidebooks apps for all climbing and bouldering areas in Pennsylvania. 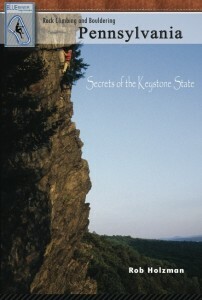 There are copies left of the Pennsylvania Climbing Guide. Get it while it lasts. Also if you have purchased this guide in 2017 we will send you a free updated PDF with all the updates going into the 2018 guides. This guidebook is available through nextascent.org you can purchase the guidebook and Pennsylvania apps here.